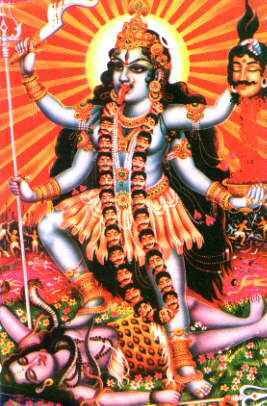 This is Kali, one of the millions of gods of Hinduism. She is the murderous, blood-thirsty consort to Shiva, another god, who is laying down in this picture. She dances on top of him and sometimes squats down on his poo-poo (called a lingham). 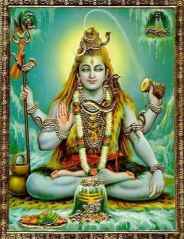 Hindus worship Shiva and his poo-poo/lingham as you will read in this article. Other names for Kali include: Kali Ma, The Dark Goddess, Dark Mother, Kalika, The Black Goddess, Kali the Destroyer, Consort of Shiva, Dancing Lady of Death. Notice she holds weapons and a severed head and a bowl to catch the blood in. Her jewelry is dismembered bodies, her necklace severed heads, her skirt is made of severed arms. You know this is of the devil. According to Hinduism, within the human body Kali is the Kundalini, the "Serpent Power", the key to liberation--if properly controlled. If not, the Kundalini will do great mental and bodily harm. Whether they know it or not, Hinduism ALWAYS does spiritual harm. Hinduism knows nothing of a God of love. Rabi R. Maharaj was descended from a long line of Brahmin priests and gurus and trained as a Yogi. He meditated for many hours each day, but gradually disillusionment set in [he saw a bunch of hypocrisy in those ashrams]. He describes vividly and honestly Hindu life and customs, tracing his difficult search for meaning and his struggle to choose between Hinduism and Christ. Who are the gods/spirits/forces that Hindus invite to come into them through nyasa (a ceremonial act to call a "deity" (a devil) into the worshipper's body) and Yoga and meditation? Many ignorant people go to yoga classes. You cannot separate the devil from yoga! The only kind of meditation Christians are supposed to do is meditating on God's word. Not clearing your mind out so a devil can come in! For Hindu friends that read this. The true God is a holy, loving and compassion God. He is also a just God that will not fellowship with the darkness and sinfulness of the human heart. All the pujas and holy baths in the world won't clean your heart. Yoga will never cleanse your deceitful heart. Karma won't do it. There is only ONE remedy. The blood of Jesus. God sent His only begotten Son, Jesus Christ, to die for your sins. On the third day, Jesus rose from the dead and now He ever liveth to make intercession for those that believe on Him. Life is not maya, it is not an illusion. It is real. You will die ONE time and that's it. You will either go to heaven or hell. There is no reincarnation. Repent of your sins and follow the Lord Jesus Christ. You need to forsake ALL the gods of Hinduism. All paths DO NOT lead to God. Jesus said, "I AM THE WAY THE TRUTH AND THE LIFE; NO MAN COMETH UNTO THE FATHER BUT BY ME." There is only ONE way to God--Jesus. Believe on the Lord Jesus Christ, and thou shalt be saved. The Lord Jesus will live inside of you and commune with you now and forever more. Jesus said, "Ye must be born again." You need a new birth. Not a new physical body, a new SPIRITUAL birth that will make you a new person on the INSIDE, NOT THE OUTSIDE. It does not matter if you are a Brahmin or an Untouchable in the Hindu caste system. God is NO respecter of persons. See How to get eternal life. You don't have to seek mystical experiences as an escape from daily life (which Hindu philosophy calls "maya", an illusion). King Jesus will give you THE POWER to face life and live for God. He doesn't give superficial peace, He gives REAL peace. Forsake anything that would hold you back from a relationship with the true God. In India, Hindus worship a pantheon consisting of MILLIONS of gods including the sun, cows, their own self, etc. Because they see some of their gods in meditation and in apparitions, they assume that their gods are the real gods. The Bible says even the devil will transform himself into an angel of light. These gods do not love them. They superstitiously try to appease the gods to keep away wrath and bad luck and also to get some good luck (e.g. Lakshmi is the goddesses of wealth and prosperity). These gods are not the Hindu's friends, they are not saviours and they do not forgive any sins. Some Hindus consider Santa Claus the fake Christian god. Santa Claus has nothing to do with the Bible and everything to do with the devil. What deception covers the whole world! 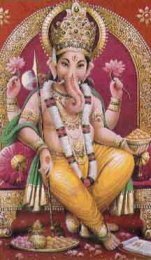 Hindus have their favorite gods--no one could give attention to every one of the millions gods--they pick and choose which to worship. There is much hypocrisy in Hinduism. Gurus say wealth is bad but they are rich while their adherents are in poverty. They take vows of celibacy but they fornicate with the girls that visit the temples. They talk of self-realization (realizing that you are god), but in actuality they are SELFish. The transgressions of gurus are oftentimes overlooked because "karma will work it out in the end". Hinduism teaches that taking any life is wrong (your great grandma could be a fly or a gnat or a snake, or a rabbit), yet some of them are found cooking up curried goat. The Hindu is seeking liberation from the illusion of individual existence. You are to recognize that you are indeed god of the universe. As a Hindu, Rabi looked in a mirror and worshipped himself as god. Krishna promised this realization to the one that practiced Yoga--not that you are becoming a god, but that you are actually a god, you just having to realize it. What a ridiculous thing. Also, only people in the four Hindu castes were god--why then are so many Westerners accepted in Hinduism (they got that cash money that the gurus like)? Hindus keep pictures of gurus in order to worship them. Romans 1 says they worshipped and served creature more than the Creator who is blessed forever--amen. Jeremiah Films has some videos on "the godmen of the east", the gurus. Those that take Hinduism to its "logical" conclusion become insane--and they are supposed to be the most holy gurus. Hinduism is exclusive though they claim all paths lead to God. Rabi's mother taught him that Hinduism is the oldest and greatest and only true religion. Of course, that is not true. A Christian can trace worship of the true God back to the very first man ever made, Adam. Guru: A Hindu teacher who helps people get off wheel of reincarnation. Gurus are worshipped. Rabi's father was a guru that went crazy. Rabi was a guru and loved being worshipped--people bowed down before him and gave him gifts. He donned a fake humility but loved the admiring eyes and hearts. He loved the fragrant floral garlands hanging around his neck. He liked people looking up to him. He sat looking in the mirror worshipping his own self. He said he was Brahman and this world was created by his own thoughts. In Yogic trances, he felt at one with the universe but in real life things were the opposite. In theory, he called reality an illusion, but real life can not be dismissed that easily. Bills got to be paid, marriages made, etc. If they lived out their theory, they would be labeled insane. In spite of his Hindu training, Rabi kept seeing God as the Creator, distinct and separate from his creation--this was a conflict that could not be reconciled with Hinduism. His religion was beautiful theory but there was no application with everyday life. If "all is god" then Brahman was evil and good, death and life, hatred and love. That made EVERYTHING meaningless and life an absurdity. If good and evil are the same then all karma was the same and nothing mattered, so why be religious? If this reasoning was maya, or an illusion--as the Vedas taught--then how could Rabi trust any concept, including that all was maya and only Brahman was real? To accept Hinduism one has to deny what reason tells them. That seemed to deify confusion as the Ultimate reality. The Lord of heaven put in Rabi's soul that he was deluded and that God is a loving, kind God who is concerned with His creatures. Rabi didn't feel he could trust any of the Hindu gods and not one of them loved him. Puja: Means "adoration". It is ceremonial worship to the gods. Hindues give flowers, fruit, cloth, water, and money to the gods. They can get so busy doing pujas that they fall behind in their temporal responsibilities. The God of the Bible, on the other hand, says worship Him BY performing your daily duties--as a man, take care of your family and work diligently for your employer. As a woman, keep up your home, love your husband and children. As a child honour your parents. Pundits: a Brahmin learned in Hinduism. He gives advice and performs different rituals and ceremonies. Not all Brahmins are pundits. Some Pundits are among the wealthiest of Hindus. They make their money off the poor who want them to say pujas and blessings on them. They'll say good luck pujas for hundreds of people to win the same lottery. The Bhagavad-Gita is the Book of books in Hinduism. Brahman: He is all gods rolled into One. He is supposedly the ultimate reality: formless, inexpressible, unknowable, and unknowing. Neither personal nor impersonal; both Creator and all that is created. Absurdity. Brahman is all and all is Braham--whether a leaf, a bug, a star, a rat, a leech. Rabi could not fathom this and was told that like other humans he was a "victim" of maya--the illusion that he was not god. In actuality, he had to OVERRIDE what the true God was telling him--that God is outside of His creation and INFINITELY GREATER than all of it. Hindus seek the "true Self" that lies within--that they are INDEED god. They are working themselves up to believe that. That is what Hinduism is. Deceiving yourself into believing you are god. Everything from an ant, to a snake to a man to a tree is the One Being, god. People just don't realize they are god. They must find this out through meditation. Ramayana: An epic showing Rama representing good and Ravana evil. But how can one sense good and evil when all was One, all was Brahman? No peace: In Yogic trances, the Hindu is Lord of the universe, but when he comes back to reality, the same unrest and uncertainty appears. The trick is to retain this transcendant consciousness when not meditating. Of course, this is impossible so therefore those who are serious have only one hope--to withdraw entirely from the world of illusion. That's what Rabi's father did. For the last eight years of his life, he let somebody change your diaper and feed him while he sat there doing nothing but staying in a trance and remaining silent as he remained on the board that was his bed. People would come to give him gifts and look at him. They considered him highly exalted, a madman. The peace experienced in meditation so easily deserted Rabi but the occult (devil) forces that Yoga aroused and lingered on outside of the trances. They began to manifest themselves in public. He knew that without these displays of the supernatural his following would never be very great. He welcomed their help. People would sense brightness and experience inner illumination when he touched them on the forehead in bestowing his blessing. He was only 13 years old and administering the "Shakti pat". Shakti is one of the names for Kali, Shiva's murderous, blood- drinking consort. This Shakti pat can make people fall out. This is just like the "slaying in the spirit" that many churches are doing today. That "slaying in the spirit" is not in the Bible but that practice is certainly in Hinduism. East meets apostate "Christianity". It goes without saying that Hindus do not know the God of love. They do not know the God that wants a relationship with us. They are unhappy, they have no help in life. No forgiveness of sin. Hindus may say that we are dogmatic for proclaiming that Jesus Christ is the ONLY way to God but they are just as dogmatic when they claim that reincarnation and karma will eventually bring all people to Krishna--whether religious or not. Maya: Illusion. Hinduism teaches that all of man's exeriences are an illusion, maya. Since Brahman is the only Reality, all else is illusion. In other words everything around us is an illusion. Deal with a problem by denying that it exists. "Oh, it's only maya". This is one of the tenets of Christian Science though they don't call it maya. Christian Science says sickness is an illusion. You just think you are sick. See our page on cults at http://www.jesus-is-lord.com/cults.htm To escape maya, you've got to meditate yourself into a fairy world to be in reality. But when they come out of meditation fairy world, they find the world (and themselves) just as they were before they went into fairy world. Hinduism says poverty is supposedly more spiritual because riches are part of the illusion of ignorance--but why was Lakshmi the goddess of wealth and prosperity if possessions were "evil" or merely maya? Yoga: Lord Krishna taught Arjuna there was nothing more important than the practice of yoga. There are different types of yoga. It is a spiritual exercise to get the Hindu in union with Brahman. Yoga takes the Hindu to other realms of consciousness totally unrelated to his temporal world. Through yoga, Hindus experience the power of devil spirits who guide them and give them psychic powers. These devils are real and are not imaginary. Yoga is an aid to eastern meditation. It deals with the physical position of the body, breathing, and renouncing all desires. Clearing your brains of everything so the devil can take over. It is designed to specifically induce a state of trance to get you yoked up to Brahman. Yoga is a means of withdrawal from the world of illusion (reality) to seek the "only true Reality" (the realm of foul spirits). People may say, "It's only exercise". NO PART OF YOGA CAN BE SEPARATED FROM THE PHILOSOPHY BEHIND IT. Rabi's father became a yogi just days after Rabi was conceived. As a result, Rabi never heard a single word from his father who was continually in a trance-like state induced by yoga. This was once considered a form of insanity (it still is insanity. possessed by a dumb spirit). As a result of reading the Bhagavad-Gita, Rabi's dad made vows which included never talking to anyone again. Like the little stone idols, Rabi's father did nothing physically for himself. He was a god to be taken care of, washed, fed and changed. He did nothing for himself or his family. Many of the godmen of India make strange vows--some put cows dung in their hair, cremation ashes on themselves, some walk around naked, etc. Though Rabi was taught his father was holy and he respected him, but he still had an intense, gnawing hunger for a relationship with his father. His father never acknowledged any human presence.. His father was totally possessed, he was past the use of mantras. He was totally reprobate crazy. See www.jeremiahfilms.com for the video "Invasion of the godmen". Transcendental medtation: The heart of Yoga. It can be a frightening experience for the adherent. Frightening psychic experiences awaited the unwary meditator, similar to a bad trip on drugs. Devils described in the Vedas were known to take possession of some Yogis. Kundalini power, said to be coiled like a serpent at the base of the spine, could produce ecstatic experiences when released in deep meditation or, if not properly controlled, do great mental and even bodily harm. In his trances, Rabi would hear "heavenly" music, see psychedelic colors, do astral travel, and have spirit visitations. He often saw Shiva sitting there with that malevolent snake around his neck. It is a fine line between horror and ecstasy. Rabi met the horrible devils depicted by images in Hindu, Buddhist, Shinto, and other religious temples. Rabi was EXTREMELY RELIGIOUS and a family devil took over him driving him to beat others. Cows: One of the many gods of Hinduism. People in India are starving to death, meanwhile cows are walking around the street eating good and being worshipped by man. Romans chapter 1 says the served the creature more than the Creator who is blessed forever, amen. One day Rabi was worshipping a cow when that heifer CHARGED HIM. It shook him up. His god attacked him although he'd always treated her with kindness. The Lord will use incidents like that as He strives with the spirit of man. God is not willing that any should perish but that all should come to repentance. Fear: Rabi was scared of many gods including Shiva and Kali. He was so scared of Shiva that he worshipped him extra in order to appease him. But he still couldn't find peace with this god known as the Destroyer. In meditation he'd find himself in another world with Shiva and the thing was always threatening. As Rabi went about his daily routine those devils he worshipped would be slapping him around and causing him accidents. They hated his guts and wanted him dead. Mantras: Used in meditation. The meaning of the words is not so important, rather it is the vibrations that they create that are the chief way of attracting "the deities" (devils). The Bible calls this vain repetition. They repeat the same words over and over in Sanskrit, the language of the gods. More important than understanding the meaning was to correctly articulate the Sanskrit sounds. The gods come through the vibrations, not through your understanding of what you are saying. That's why Buddhism teaches people Japanese mantras but doesn't tell them what the words mean. People just go on like an ox to the slaughter not excercising any discernment. Meditation: technique for detaching oneself from the world of things and ideas (from maya) through freeing one's mind from all voluntary or rational thought. This projects one into "higher" states of consciousness. In these "higher states" one can visit the secret universe of strange planets and "ascended masters". This is actually only a trick from the Satan to keep you in a fairy land while he gains more and more possession of your soul. Adherents enter meditation while fixing their gaze on one spot until they loose contact with the world around them. Reincarnation: The process of being physically born again. Birth, death, re-birth. In the east, a curse, in the west a blessing to come back and sin some more. Karma: There is no forgiveness in Hinduism--only karma. If you do wrong you will pay for it in the next life--this is working out your karma your punishment for sin. Each person MUST suffer for his sins. If someone is suffering in this life, it is assumed they are paying for some evil they've done in their past life-- even though they don't remember what they did wrong. That's why they can walk by some low caste member who is dying on the street and feel nothing. Karma is the law of cause and effect which determines destiny/fate. For every thought, word or deed karma produces an inevitable effect. Karma necessitates reincarnation so you can pay for the sins you've done in your past life. Rabi once knocked over a Krishna idol (god) on the floor and wanted to say "Sorry" but he knew no apology would be accepted. The unchangeable law of karma forbade it. He would have to continue on the wheel of reincarnation. One transgression will keep you in the system. Reincarnation is a CURSE to the real Hindu. In the west, it makes people happy to think they can come back and sin some more. If that brass figure was god, why did it fall so easy? Why do Hindus have to carefully wrap their gods and put them up for safekeeping? Because they are no gods. Caste: A cruel system supported by Krishna in the Gita--probably devised by the Aryan invaders of India in order to keep the darker skinned Dravidians they conquered in quiet subjection. The four castes are Brahmin, Kshatriya, Vaisya, and Sudra. The doctrines of karma and reincarnation followed naturally, teaching that lower castes by accepting their lot in life could inprove in the next life. The Untouchables were below caste and thus outside the religous system of Hinduism. The God of the Bible, the true God, is no respecter of persons. Anyone who will repent and love the Lord will be saved. Prejudice: All of Rabi's life he nursed a deep hatred for black people, because they ate his god the cow. He counted them lower than the lowest caste. Eventually he went to high school with them. His interaction with blacks, whites, and orientals made him question his beliefs. According to the Vedas there are only four castes created from the body of Brahma--so there was no basis for even the EXISTENCE of anyone else in the world. Yet he saw with his eyes many other types of people. How did they come into existence? Why weren't they mentioned in the Hindu scriptures? Why couldn't they get salvation through Yoga and reincarnation? They were lower than the Untouchables and without hope according to his religion. Yet he found that they were in no way inferior to him. One day he received a flurry of questions at school that began to rock him. "Is it true that Hindus believe everything is god?" "You mean a fly is god, or an ant, or a stinkbug?" "You laughin' because you don't understand. You see only the illusion but don't see the One Reality-- Brahman." "Yes, and so are all Hindus. They just need to realize it." "How're you going to 'realize' what isn't true? You didn't create the world!" "I hear you're a vegetarian--don't believe in taking any life..."
"I believe in no-violence. Like Gandhi. Everybody respects him. He was a great Hindu! It's wrong to take life." "All life is sacred. The Vedas say so." "Don't you know that even vegetables have the seven characteristics of life? Vegetarians take life too." "How about when he boils water for his tea? Think of all the millions of bacteria he kills then! Poor, helpless little animals--that's what they are. You know, they evolve and reincarnate upwards--eventually into cows and humans!" "Gosh, he's a regular murderer!" Rabi went home and grazed the cow and asked her, "You are a god, aren't you?" She just said "Moo." "If Lakshmi is the goddess of wealth and prosperity, why are Hindus so poor?" "A man can be poor in one life and wealthy in the next." "How many reincarnations does it take? Look around! Most East Indians are cane-cutters, living in poor houses...." "Look at India--it's the most miserable country in the world! ...There are more rats than people, and such poverty and disease!" "People are starving in India, while the rats get fat and the sacred cows die of old age! That's what her gods and reincarnation have done for India." Ahimsa: The doctrine of nonviolence toward all life. Hindus believe that insects and animals, through good karma, evolve upward to become humans--and that humans through bad karma, can become animals or insects again. Therefore it would be cannibalism to eat meat. Ahimsa is not consistent with the Hindu scriptures or practice. Many Hindus will still make animal sacrifices and kill during war. Some even sacrifice their firstborn though this is not often mentioned. Hindus have, however, consistently refrained from killing cows. Lingam: phallic emblem of the god Shiva. In other words they worship his poo-poo. Adherents will lay down prostrate before a large poo-poo. Superstition: "My world was filled with spirits and gods and occult powers, and my obligation from childhood was to give each its due." Supernatural manifestations: Objects may fly without any seen cause. Physical attacks by unseen hands. Apparitions. I knew a woman studying Buddhism and I asked her about manifestations and she said "just an ashtray flew across the room." Other notes in the book: wife-beating quite common, p. 21, child sacrifice is known p. 22, powerful sorcerers are revered and feared p. 23. Rabi's grandfather seemed possessed of a devil. He had supernatural strength, anger and cunning p. 47. They had familiar spirits in objects such as a a stone p. 23. Some witches even have familiars in animals or plants. All these groups are tied together by one factor--the devil. comes from Yoga Guru 's are extremly dangerous individuals."